As the temperatures being to drop, there is nothing I love more than a cozy bowl of chili. To lighten things up, mine uses ground turkey and pumpkin purée, which give it tons of healthy protein and fiber. It is absolutely perfect for your next Football Sunday or Fall potluck, and is sure to be a crowd-pleaser! 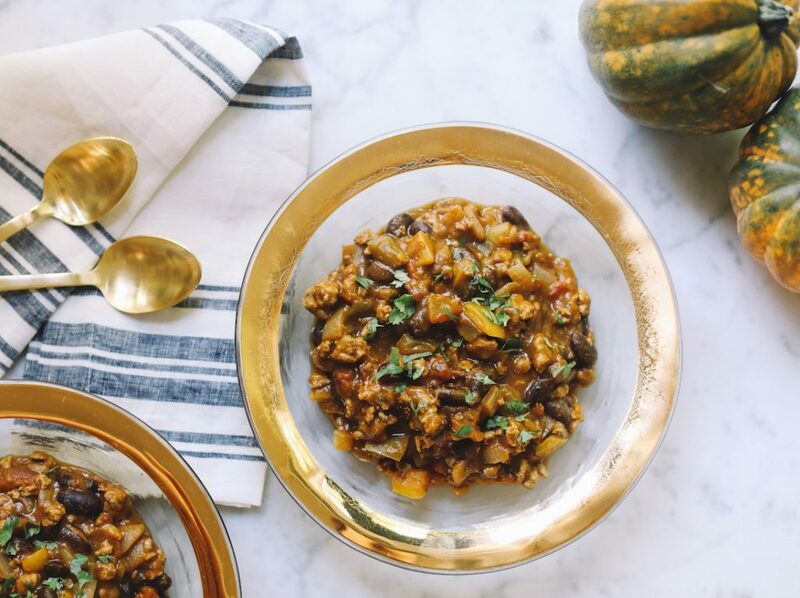 Hope you’ll give my simple and yummy Pumpkin Turkey Chili a try and let me know what you think! Also, don’t forget to tag me in all of your foodie creations at @livlight_ and #livlight. Heat oil in a large skillet or Dutch oven over medium-high heat. Sauté the onion, peppers, and garlic until tender, about 10 minutes. Make room in the center of the veggies, add turkey, and brown, about 10 minutes. Stir in tomatoes, beans, and pumpkin. Season with chili powder, cumin, pepper, salt, and cayenne. Reduce heat and simmer at least 20 minutes. Stir in fresh cilantro.